Pigeons on a Train is a mobile arcade game mixing live action building and shooting. A horde of pigeons attacks your train : build defences and shoot them down! The goal is to last as long as you can by building automated weapons and bunkers on your train as well as using your shotgun to destroy the invading and evil pigeons. An artist has joined the team and here's a screenshot showing the new arts. The scrolling background has a parallax effect. Different weapon types and two kind of pigeons have been made with more to come. Stay tuned! 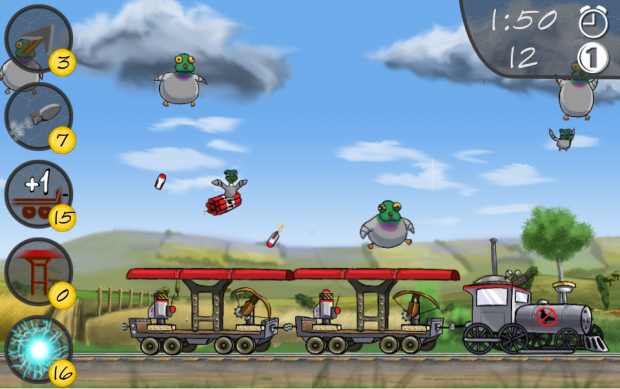 Pigeons on a train is a mobile game where you have to defend your train by using your shotgun and building automated turrets on wagons to defend against the most evil of all species, pigeons. The game has been in development for a month now and an early demo is now available to play directly in your web browser.